A/O 4.19.19 based on 2 people per cabin are as follows. Based on availability, subject to change until booked.Contact Denise to check for current rates and availability. Deposit (non-refundable) Deposit due at booking. Based on 1 or 2 people per cabin. Contact Denise to for a current quote and to check availability if promo is expired or for an unrestricted rate quote. The above rates are cruise only.I will have a quote later for the air or you can purchase your air on your own. Air is only in the system about 330 days out so around the end of Dec or first of Jan the air will be in the system. We cannot add ground transfers until we have our flight number and arrival/departure time. We have not yet decided if we will just fly in and out for the cruise or stay over in Miami. Transportation Cost Between Miami International Airport and Port Miami: One-way: $16.99*. 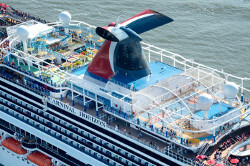 To purchase Carnival’s transportation service, your flight must arrive at Miami International or Ft. Lauderdale International Airport no later than 1:30 PM on the day of your cruise. Transportation service will be provided between 10:00 AM and 2:30 PM. Guests who purchase their own air are required to provide flight information via Online Check-In when purchasing transportation.